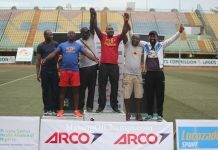 The Track and Field Coaches Association of Nigeria (TAFCAN) meet made a return on Friday, with mainly athletes based in Lagos competing in the events held at the Teslim Balogun Stadium. 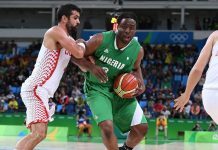 It’s the second TAFCAN meet in 2018, and with a lot still to fight for in the season, the meet afforded the athletes an opportunity to continue their build-up for the upcoming competitions this year. 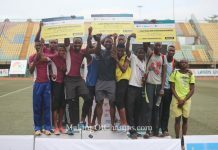 Many Athletics clubs sent in their athletes to square up against each other, and it was a two-way battle of dominance between the Making of Champions Lagos Track Club and Eaglesight club. 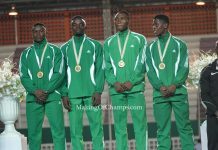 Back from Australia having represented Nigeria in the men’s 110m Hurdles, Abejoye Oyeniyi was the one to beat in the men’s 100m, running the fastest time of all the heats, easily winning heat 6 with a time of 10.5s. 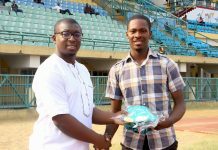 Arinze Benjamin was the 2nd fastest overall with a time of 10.6s. 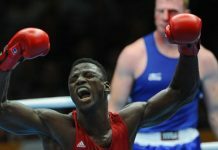 Oyeniyi despite joking while competing in his 100m heat, still easily ran the fastest time of all the heats. 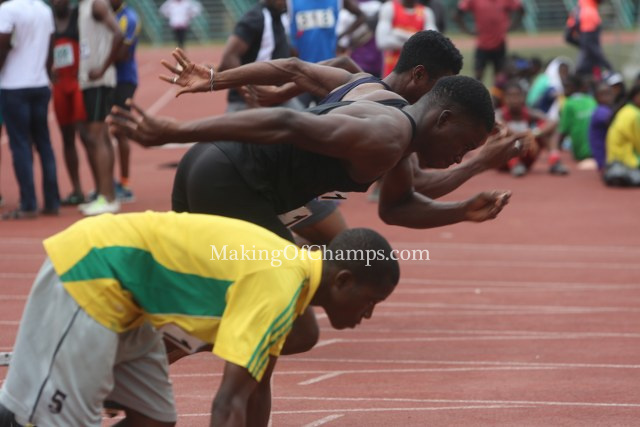 Kingsley Bassey who won heat 7 of the men’s 100m, finished 3rd overall with a time of 10.8s (10.77s) and MoC’s Bowofoluwa Egbeyemi who had an impressive outing finishing with the 4th best time overall having won heat 2 in 10.8s (10.78s), he did that holding off his teammate, Emmanuel Ojeli who finished 2nd behind him in that race with a time of 10.8s (10.80s). 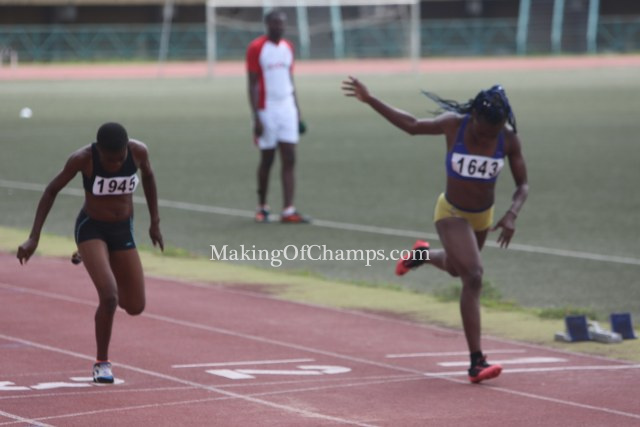 In the women’s 100m, there was no stopping Blessing Ogundiran who easily won heat 1 to emerge with the fastest time of 11.8s. 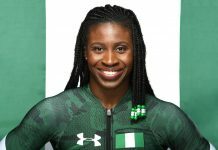 Ogundiran who last month ran a Personal of Best of 11.48s at the Abuja Golden League will be hoping she can improve further in subsequent competitions to continue in her quest to break into the national team. 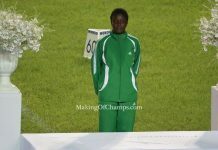 Anita Taviore who won heat 2 in 12.2s, finished 2nd overall with Alimot Alowonle who was 2nd to Ogundiran in heat 1, finishing 3rd overall in 12.5s. 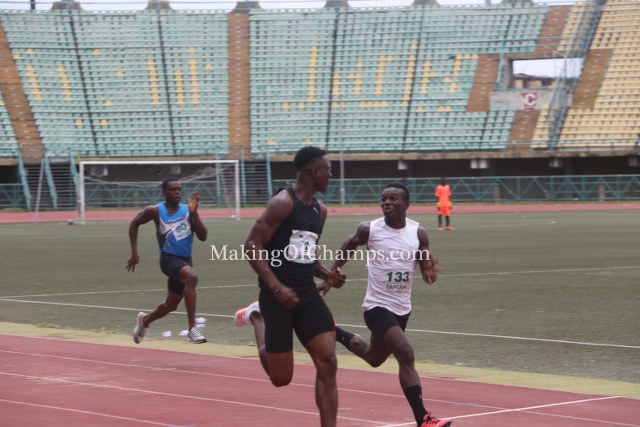 In the men’s 200m, Oyeniyi also posted the fastest time of all heats, winning heat 4 with a time of 21.4s while MoC’s Peter Edwin was the 2nd fastest overall, winning heat 5 with a time of 21.5s and Ayodeji from Osheku track club who finished 2nd in that heat, emerged the 3rd fastest overall with a time of 21.6s. 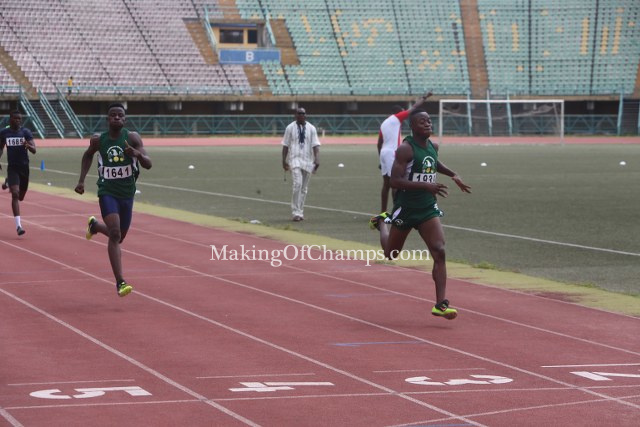 Meanwhile in the men’s 400m Adedoyin Fatola was the fastest in all the heats, winning heat 1 with a time of 49.6s. 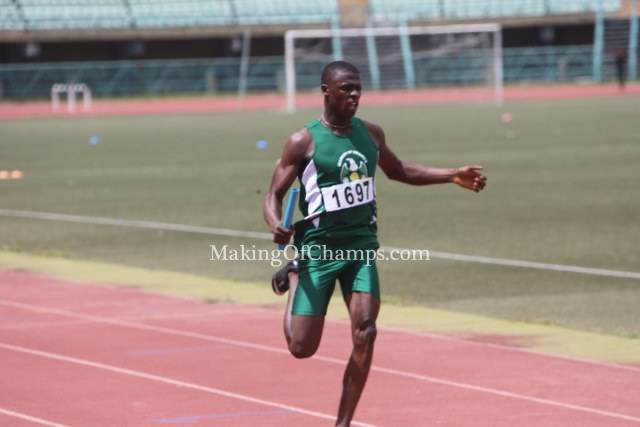 MoC’s Bunmi Lateef ran the 2nd fastest time of all the 400m heats, beating his teammate Segun Akhigbe to win heat 3 with a time of 49.8s. 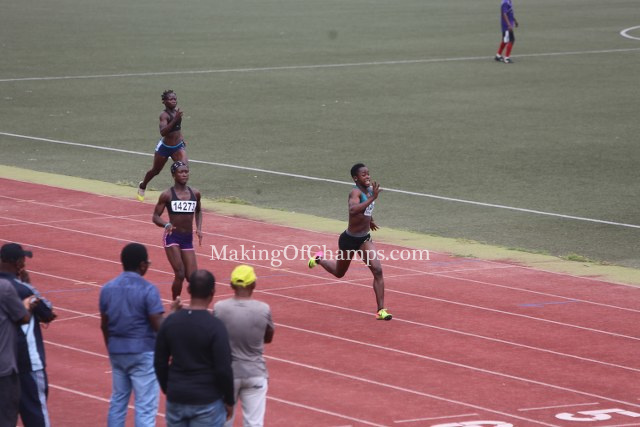 Akhigbe who was 2nd in that race, finished 3rd overall with a time of 50.1s while Olaoluwa Ojo who won heat 1 with a time of 51.1s was 3rd overall. 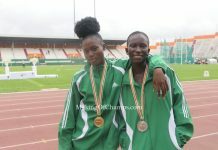 Team Olapade won the women’s 4x100m, crossing the line in 49.2s ahead of Arena club who was 2nd in 50.3s and Osheku club 3rd in 50.64s. 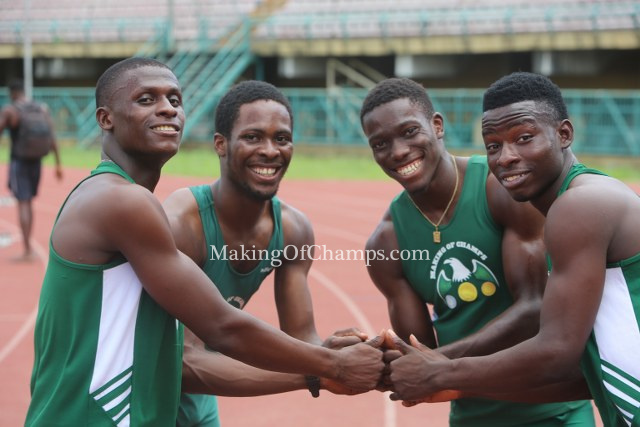 In the men’s 4x100m, Team MoC presented two teams and it was the quartet of Egbeyemi, Edwin, Akhigbe and Emmanuel Ojeli who ran the fastest time of the two heats to emerge the overall best with a time 42.2s having won heat 2. 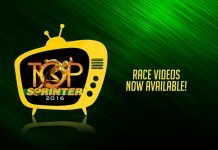 Eaglesight finished 2nd overall winning heat 1 clocking 42.8s and Arena club 3rd with a time of 43.0s. 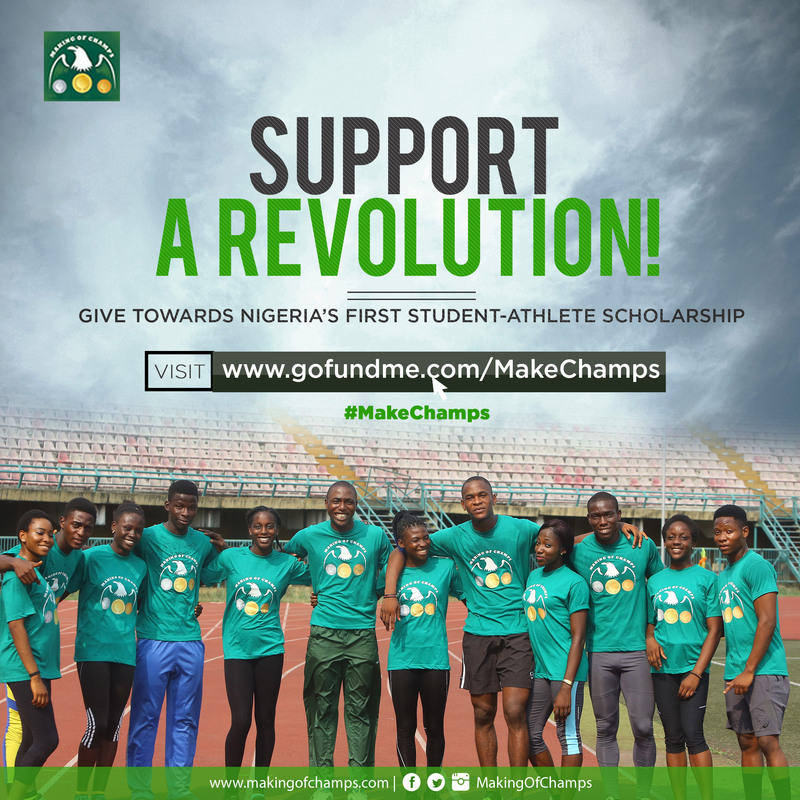 There were few athletes who competed in the field athletes with the women’s Long and Triple Jump events having just one competitor for each event. 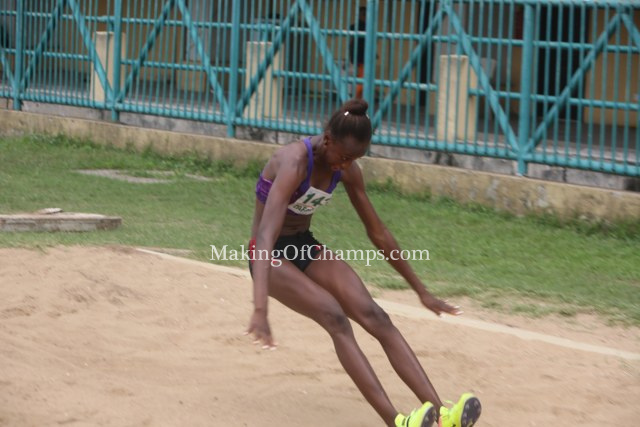 Esther Isa jumped a mark of 5.41m in the Long Jump, with Onaara Obamuwagu leaping a distance of 12.31m in the Triple jump. 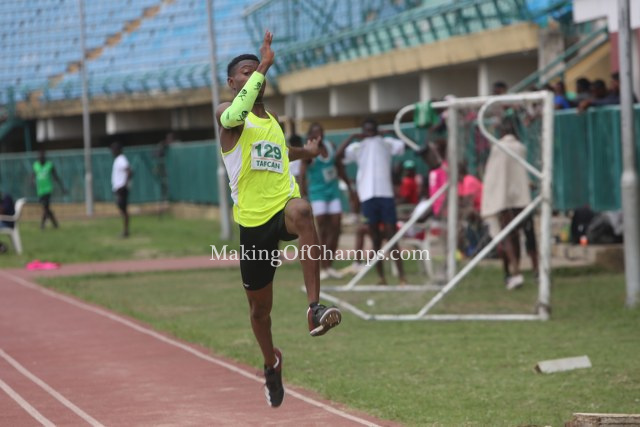 In the men’s Long Jump, Arinze Benjamin won with a mark of 7.64m beating Peter Moreno who was 2nd having jumped a distance of 6.33m and Maxwell Okelezo 3rd with a jump of 6.29m.